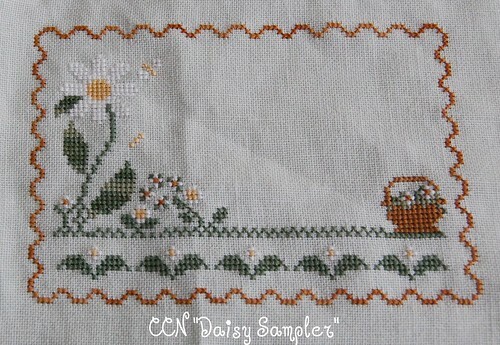 Daisy Sampler as of 3/12/08, originally uploaded by nevillen. I love your samplers, you are making beautiful things! It's so cute, and so spring:-) Have a great day! Very pretty and some nice progress! You stitch so fast! I am in awe of you. Bad enabler!! I have this one in my stash - I can hear it calling my name. You're making great progress! It is looking great Nicole. Now I have to do this one - THANKS A LOT. lol Daisies are my favorite flower so I guess I should do it anyway. DH gave them to me on our first date. This is one I have on my wish list so I love the design and you are stitching it beautifully.